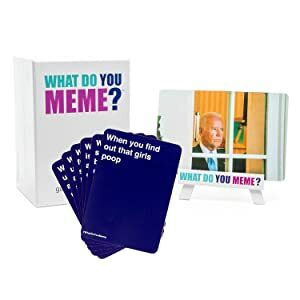 Think you’ve got what it takes to out-meme your friends IRL? Compete to create the funniest meme by pairing Caption Cards with the Photo Card in play. A rotating judge picks the best combination each round. Play until you’re hungry, at which point stop playing and order a pizza. 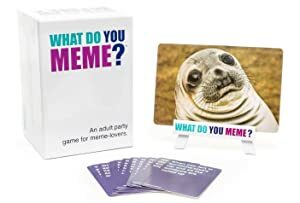 Party card game for friends for the social media generation. 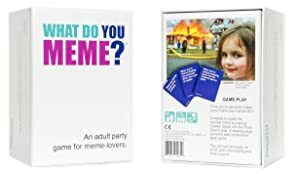 Think you’ve got what it takes to out-meme your friends IRL? Compete to create the funniest meme by pairing Caption Cards with the Photo Card in play. A rotating judge picks the best combination each round. Play until you’re hungry, at which point stop playing and order a pizza. The rules are simple. Each round, a rotating judge plays a Photo Card and everyone else plays a Caption Card to complete the meme. The judge decides the funniest pairing, and whoever played the winning Caption Card wins the round. Lather, rinse, repeat. Easy to learn. Fun to play.